Eat yourself calm with this informative guide to eating right and de-stressing. Have you ever considered that what you eat might be affecting the way you feel? If you often feel stressed and uneasy, perhaps something is wrong with your diet. Whether you need to boost your energy levels, calm your mood swings or placate your irritability, look no further! This book will provide you with lots of great-tasting recipes that will do the trick. Dark chocolate, mangoes, salmon, ginger and oats are just some of the many superfoods that positively support the body's systems during periods of stress. Through a nutritious weekly plan, Eat Yourself Calm will lead you from a diagnosis of your problems to cooking your way out of it. 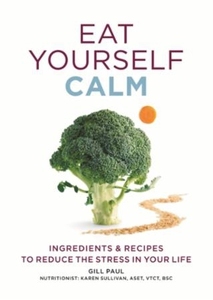 Eat Yourself Calm includes... Part I Happy Superfoods Superfoods What's your problem? Putting it all together Part II Calm Recipes Breakfast Snacks Lunch Dinner Desserts ...And much much more!